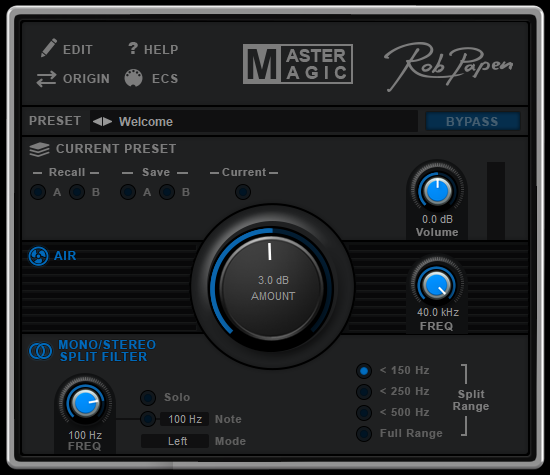 Welcome to -MasterMagic- the plug-in that you will not want to miss anymore as part of your virtual mixer master section! Just place -MasterMagic- at the very end of the master FX chain and be surprised how much it can do for your track! The ‘Mono/Stereo’ section, will make your low end much tighter and the ‘AIR’ function is sheer magic…even if you only use it a tiny amount. I am a long time Rob Papen software user, I love his products because they are original, innovative, sonically different and provide a unique way to see and manipulate sound. 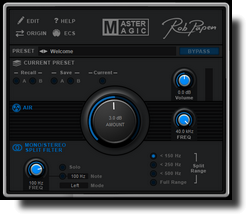 Their recent MasterMagic is a simple and effective tool to give your mix a magic touch!